We invite you to participate our study courses. You have the unique opportunity to study the state-of-art of cryptography and cryptanalysis at Novosibirsk State University that is located in the world-famous scientific center in the heart of Siberia — Akademgorodok. • to immerse yourself in the amazing atmosphere of Akademgorodok, where the real science and wonderful nature are so close to each other! Corresponding member of the Russian Academy of Sciences, Doctor of Sciences in Physics and Mathematics, Full Professor. Doctor of Sciences in Physics and Mathematics, Full Professor. NSU provides modern, internationally competitive, classical fundamental education. We pay special attention to the comprehensive development of each student. NSU Education will teach you how to think more broadly, to find creative solutions and to achieve success in any field. Education at NSU DMM offers a wide range of possible professional careers. A career in science is the most evident and relevant result after completing one's studies. Many graduates choose such career path and achieve considerable success occupying leading positions in research centers and universities all over the world. 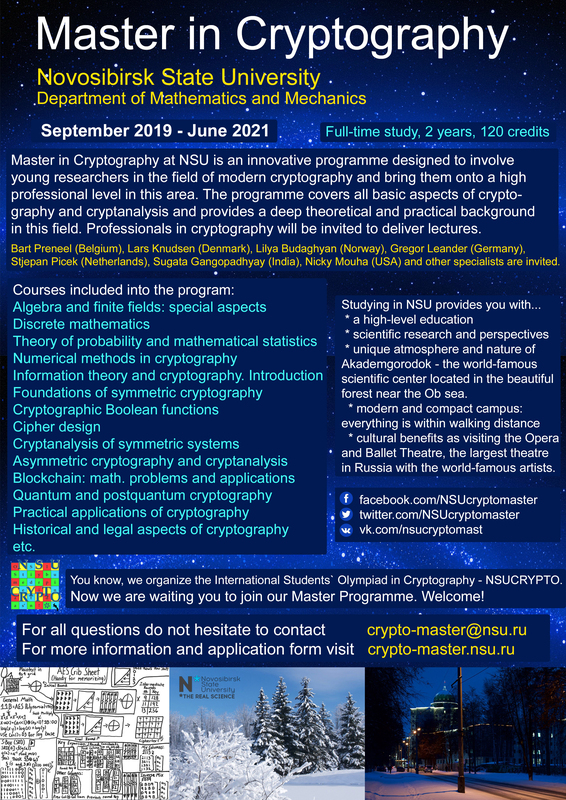 Master in Cryptography at NSU is an innovative programme designed to involve young researchers in the field of modern cryptography and bring them onto a high professional level in this area. The programme covers all basic aspects of cryptography and cryptanalysis and provides a deep theoretical and practical background in this field. Professionals in cryptography will be invited to deliver lectures. PhD. Note that there is a possibility to continue your study in post-graduate course and to defend PhD thesis in mathematical problems of cryptography at NSU. Research interests are: symmetric cryptography, Boolean functions and discrete mathematics. Natalia Tokareva is an author of several monographs and tutorials in cryptography, a supervisor for MS and PhD students, a general chair of the international Student's Olympiad in Cryptography NSUCRYPTO. The educational programme is well-organized in order for students to get deep knowledge in cryptography and cryptanalysis. All courses are carefully thought out and linked with each other. This course covers some basic concepts of algebra and finite fields that have applications in cryptography. You will meet links between finite fields and vector spaces, functions and polynomials over finite fields, recurrent sequences and their characteristics, groups of automorphisms of different objects, special arithmetical algorithms and symbols, mathematical background of primality tests, etc. The course covers such topics of discrete mathematics as enumerative combinatorics, elements of probability theory, Boolean functions, graph theory. Students will reach a certain level of mathematical maturity becoming familiar with a wide range of mathematical objects that are ubiquitous in computer science; being able to understand relations between them and proof formal statements concerning them. their characteristics, stationary and Markov random processes, etc. methods, discrete logarithmic methods, basic theory of elliptic curves will be considered. The course contains chapters devoted to basic notions and concepts in information theory and cryptography. The following topics will be discussed: elements of signal theory, error-correcting codes, data compression, brief overview of main classical results and modern methods of cryptography, introduction into cryptanalysis. This course is devoted to a huge branch of cryptography and contains such chapters as evolution from one-time pad systems to modern encryption methods, general constructions of block and stream ciphers, well-known examples of ciphers, symmetric primitives implementing the principle of confusion and diffusion, key management, open problems and perspectives. It is well known that S-boxes form a very important nonlinear part of a modern symmetric cipher. Resistance of a cipher depends significantly on their properties. Mathematically, S-box is a vectorial Boolean function. In this course we study basic cryptographic properties of Boolean functions in detail. We deal with balanced, non-linear, resilient and algebraically immune functions, bent functions, APN functions and their generalizations. We focus on constructions, classifications, equivalence and open problems. This course provides deep knowledge on the attacks on block and stream ciphers. Starting with basic ideas as birthday paradox, brute force and meet-in-the-middle attacks, we come to statistical and algebraic methods of cryptanalysis, distinguishing attacks. Side-channel attacks as well as other modern techniques and results in cryptanalysis will be also considered. From basic principles of public-key cryptography we turn to the well-known asymmetric schemes (DH key exchange protocol, RSA, ElGamal, McEliece, etc.) and discuss their important theoretical and practical aspects. Then we focus on digital signatures, elliptic curve cryptography, problems related to complexity of public-key algorithms and open questions. Various attacks on the public-key system will be also reviewed. The course covers basic concepts of cryptocurrencies, mining mechanisms and Bitcoin protocol in context of anonymity, traceability and security. Blockchain technology is considered as a platform for a broad range of applications; the future of cryptocurrencies and blockchains is discussed. Such aspects are being observed in the course as an introduction to the quantum technologies, necessary mathematical toolbox, pure and mixed quantum states, classical quantum states, quantum key distribution protocols (BB84, B92, etc.) and attacks on them, quantum hashing, principles of postquantum cryptography. The course gives a detailed overview of modern cryptography real-world applications such as secure network communications, encryption devices, authentication methods, key-exchange techniques, voting and cryptocurrencies, mobile phone security, RFID technology, smart cards and payment systems. Approaches related to biometric encryption are considered, for example, those based on iris and voice recognition. The main goal of this course is to provide a broad overview of history and development of cryptology, its long (and may be infinite?) way from art to science. A number of different ciphers and techniques that were used all over the world before the World War II and after it, first methods of cryptanalysis, cipher machines and key persons in cryptography will be considered. We observe some legal aspects of cryptography, standardization process, regulation of cryptographic applications and many other important details. Full professor in the research group COSIC of the Electrical Engineering Department of the University of Leuven (Belgium). Director of the International Association for cryptologic Research. network security and mobile communications. Bart Preneel is a world-known leader in cryptography. With colleagues he created several ciphers and hash functions (MUGI, Trivium, RIPEMD-160, etc.) and contributed to the cryptanalysis of many known cryptographic systems. He is one of the leaders of COSIC, a very successful cryptographic group. Note that the cipher AES, the modern standard of symmetric encryption in the USA, was invented namely there. Full Professor at the Department of Applied Mathematics and Computer Science at the Technical University of Denmark. Member of the Danish Academy of Technical Sciences. The main interest is cryptology, in particular analysis and design of block ciphers, hash functions, and message authentication codes. He is one of the key specialists in cryptanalysis and cybersecurity in the world. Block ciphers DEAL and Serpent designed by Lars Knudsen and his colleagues were outstanding candidates for the AES standard. The hash function Grøstl developed by the team of Lars Knudsen was in the final of the SHA-3 standard competition. Professor Knudsen introduced the technique of impossible differential cryptanalysis and so-called integral cryptanalysis. Dr. habil., Researcher at Reliable Communication Group at the Department of Informatics in University of Bergen (Norway). Research interests are: symmetric cryptography, Boolean functions, discrete mathematics, algebra, finite fields, and mathematical logic. Lilya Budaghyan is a well-known specialist in cryptographic vectorial Boolean functions over the finite fields. She obtained great results in their classification as well as studying their properties. Professor Budaghyan is an excellent supervisor for many students of hers interested in complicated algebraic problems of S-box design. Professor at the Ruhr University Bochum (Germany). Head of Workgroup for Symmetric Cryptography, general chair and program committees member of such conferences as CRYPTO, EUROCRYPT, FSE, ASIACRYPT and many more. His research focuses on the design and analysis of symmetric cryptographic primitives, including but not limited to block ciphers, hash functions, lightweight cryptography and Boolean functions. Gregor Leander is known as one of the leading researches in the area of symmetric cryptography. With his colleagues he designed a lightweight block cipher PRESENT that became an ISO standard for Light­weight Cryptography. He is a co-author of the lightweight hash function SPONGENT and family of lightweight block ciphers SKINNY. Great achievements in the classification problems for APN functions were obtained by him as well as finding new constructions of highly nonlinear Boolean functions and S-boxes. PhD, Assistant professor at Delft University of Technology (The Netherlands), Researcher at Massachusetts Institute of Technology (USA). Main research interests are at the intersection of cryptography, cybersecurity, evolutionary computation, and machine learning. Evolutionary computation is a research area within computer science that draws inspiration from the process of natural evolution. These principles can be applied in obtaining cryptographic Boolean functions, S-boxes with desired properties, pseudo-random generators. Stjepan Picek is a highly-qualified young specialist in this area. Associate professor at the Department of Computer Science and Engineering of Indian Institute of Technology Roorkee (India). Research interests are: algebra and information theory, mainly in cryptographic Boolean functions and stream cipher cryptanalysis. Sugata Gangopadhyay contributed a lot to the area of cryptographic Boolean functions. He is a participant and coordinator of many successful international projects in cryptography and information security that he is combining with creative scientific work together with young researchers. PhD, Researcher at the Computer Security Division of the Information Technology Laboratory at NIST (USA), Associate Member at the CASCADE team of ENS (France). Research interests are: lightweight cryptography, hash functions, automated techniques for cryptanalysis of block ciphers. Nicky Mouha is a young but well-known specialist in cryptanalysis and design of hash functions, symmetric-key ciphers and protocols. He is a co-author of the MAC algorithm Chaskey and the family of lightweight permutation-based authenticated encryption schemes PRIMATEs. At National Institute of Standards and Technologies (NIST), he works on the standardization of lightweight cryptography. Dr. habil., Professor of Russian Academy of Science, Head of Laboratory of Rings Theory at the Sobolev Institute of Mathematics. Research interests are: noncommutative rings and algebras, conformal algebras and number theory. Pavel Kolesnikov is a well-known specialist in algebraically closed skew fields, conformal algebras and pseudoalgebras. He has been teaching courses on number theory and abstract algebra at Novosibirsk State University for a long time. Also, he is visiting professor of University of California in San Diego and University of Sao Paulo. PhD, Senior researcher at Sobolev Institute of Mathematics, assistant professor at NSU Department of Information Technologies. Main scientific interests are in the field of the intersection of combinatorics, graph theory, algebra, and algorithmic information processing. Evgeny Gorkunov has been teaching courses in discrete mathematics and coding theory for almost ten years. He is a well qualified and talented lecturer. Completing his courses, students successfully find jobs in IT, industry, engineering, education and science. PhD, Associate professor at Novosibirsk State University. Research interests are: probability theory, statistics, multiple stochastic integrals of non-random functions, statistics of dependent observations, limit theorems, and inequalities for U- and V-statistics. Alexander Bystrov is an experienced specialist in the field of probability theory and statistics. He teaches corresponding courses at a few departments of Novosibirsk State University. PhD, Researcher at Sobolev Institute of Mathematics, assistant at Novosibirsk State University. Research areas are pseudorandom sequences, cryptographic Boolean functions, bent functions, and discrete mathematics. Nikolay Kolomeec is experienced in teaching as well as in programming, especially one linked with research problems. He has completed training at the International Course on Cyber Security and Cryptography in the research group COSIC at University of Leuven. Researcher at Novosibirsk State University, lecturer at Novosibirsk State University and NSU Specialized Educational Scientific Center. Research interests are blockchain technologies, cryptography, and discrete mathematics. Every year, being a student, Alexey Oblaukhov got prizes on international olympiads in mathematics and cryptography. Thus, in 2016 he received the First Prize at the International Mathematics Competition for University Students that is the most reputable event for this kind for young mathematicians. Now he trains school and university students for various competitions in mathematics. Researcher at Novosibirsk State University, lecturer at Novosibirsk State University. Work interests are: in mathematical problems of quantum cryptography and cryptographic Boolean functions. Alexander Kutsenko obtained interesting results on properties of isometric mappings of the set of bent functions. He is a perspective young teacher; at present he teaches the course on quantum cryptography at NSU Department of Mathematics and Mechanics. Duration: two academic years, full-time study, 120 credits. The programme includes elements of a modular system. It means that an invited lecturer presents an intensive course for a limited period of time. The rest of 120 credits are covered by scientific practice, diploma work and defense. at Novosibirsk State University and Sobolev Institute of Mathematics. (with the exception of Physical training). "Historical and legal aspects of cryptography"
will be added to the scedule later. Students live in new comfortable dormitories located in a couple-of-minutes walk from NSU. Each single room is equipped with a desk, a bed, a wardrobe, a private bathroom. Students are given the opportunity to run at the stadium, swim in the 25-meter swimming pool, play tennis and other sports games, ski along a forest path as well as many other activities. Tuition fees does not include cost of living which does not exceed $20 per month. Without a doubt NSU is one of the leading universities in Russia. See for yourself. 80% of NSU faculty members are scientists from the Siberian Branch of the Russian Academy of Sciences so the education is carried out in close connection with the world-class scientific achievements. NSU history is the history of thousands of graduates who have fulfilled themselves in science, business and the creative arts. Everything is within walking distance: the dormitories, a sports center, a stadium, 35 scientific institutes, and an innovative technopark are within a 10 minute walk from campus. Which is the world-famous scientific center located in the heart of a beautiful forest next to the Ob sea. Such as visiting the Opera and Ballet Theatre, the largest theatre in Russia with world-famous artists. Anyone can find something to enjoy in Novosibirsk: winter snow or summer on the beach, the rhythm of the modern metropolis or the grandeur of vast forests and fields, the permanence of traditional cultures or the best of science in Russia. And, of course, you will definitely feel real Russian hospitality. You know, we organize the International Students' Olympiad in Cryptography — NSUCRYPTO. Note that a successful participation in the Olympiad will be considered as a significant personal achievement for application to «Master in Cryptography». Welcome! • NSU campus is a stunning place for an active lifestyle! • And more videos on «NSU Life» channel. Novosibirsk State University, 1, Pirogova str., Novosibirsk, 630090, Russia.